This is a West Coast twist on an East Coast roadside stand classic, the Lobster Roll. I predict it will soon sweep though miserly sculleries everywhere -- for few can resist a culinary creation like this: the 99 Cent Chef's cool, creamy, and deliciously decadent Scallop Roll. I've never had the pleasure of trying a Lobster Roll, but if I ever find myself driving through New England, it is on the top of my culinary to-do list. The Lobster Roll started out as chopped cooked lobster meat mixed with butter on bread, but since the 1970's, the lobster chunks have been mixed with mayo and served cold on a top-spit hot dog bun lightly toasted in butter. Some modern versions still mix steamed chopped lobster with butter, but with mayo on the side. 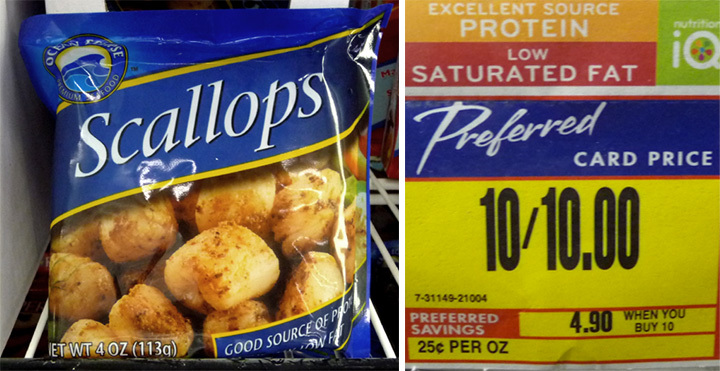 I always find 4 ounce frozen packages of scallops at the local Alberstons grocery chain, ten for ten dollars (you are allowed to buy one package at a time), and sometimes at my local 99c Only Stores. It's a small amount of seafood but enough for a couple of Scallop Rolls. You can add crunch to the Scallop Salad by adding fine chopped celery, seeded cucumber, green scallions or regular onion -- this also helps stretch it out for an extra serving. In my Scallop Roll photos I used peeled and chopped seeded cucumber, which works well because it won't overwhelm the mild, sweet scallops. Since the original Lobster Roll was made with butter, I am keeping my recipe old school by sauteing the bay scallops in butter; and riffing on the now typical way by mixing the cooked scallops with mayo. It's a rich and complex combination. This recipe tastes best with real butter and real mayonaise -- save the light mayo and butter substitute for when you are feeding a horde of inebriated, palate challenged party guests, or for dieting days. 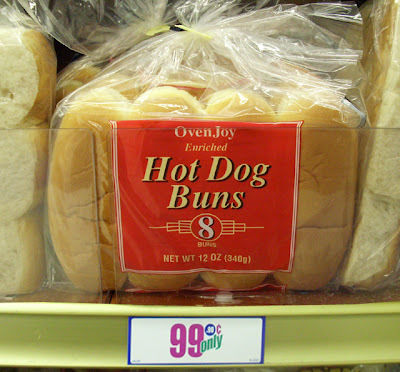 And since "top-loader" buns (split along the top of the bun) are not to be found on the West Coast, I used regular hot dog buns. You can use fresh bakery buns or small dinner rolls, as well. Balmy summer days are right around the corner, so now is the time to stock up on 4 oz. frozen packages of scallops, and perfect The 99 Cent Chef's Scallop Roll for your first summer patio party! 2 tablespoons of real mayonnaise - let's get decadent. 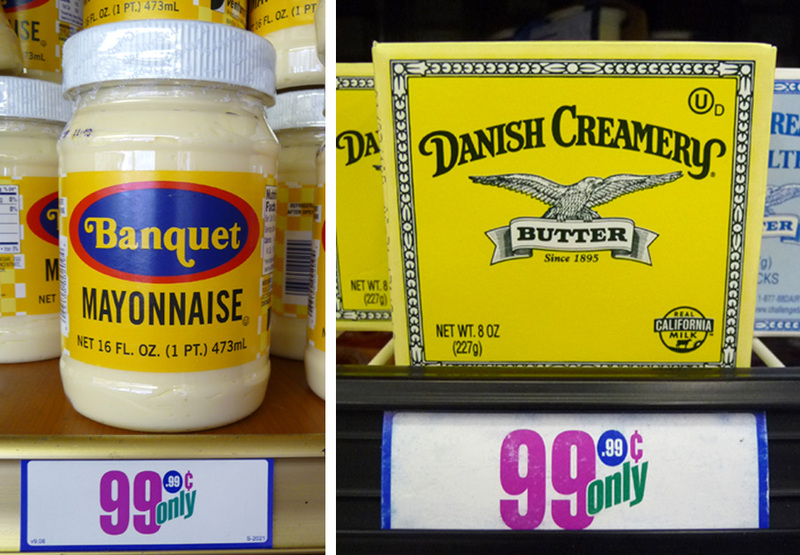 But if you must, you can use your favorite light mayo. 2 pats of butter - or favorite low-cal substitute. One pat for sauteing scallops, and one for toasting the hot dog buns. Optional additions: a couple of tablespoons of fine chopped celery, green scallions or regular onion. A sprinkle of a favorite herb, seafood spice, or a pinch of cayenne pepper for heat. I just used peeled and seeded cucumber for this version. You can also add some roughly chopped or hand-shredded lettuce. Drain scallops of liquid and saute in a pat of butter (or favorite butter substitute) over a medium heating skillet. Saute for a couple of minutes, stirring as you go. Small scallops cook quickly, and will finish cooking as they cool down. 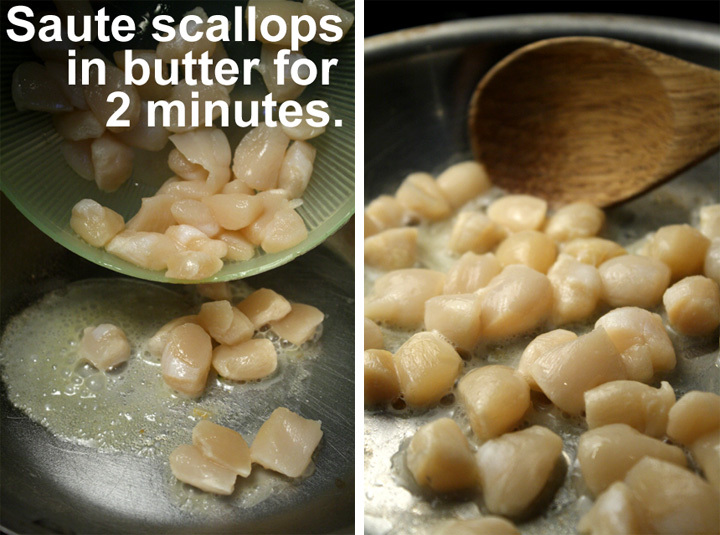 Remove scallops to cool. Poor out the liquid from cooked and cooling scallops. This sweet buttery broth can be saved and reheated later to coat the inside of the roll for a "dipped" Scallop Roll. 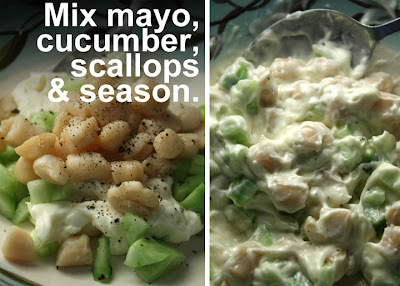 In a medium sized bowl add mayo* and about 2 tablespoons of peeled, seeded and chopped cucumber. Add drained scallops and mix well - season to taste. Cover and chill in the refrigerator for a couple of hours. I've also had it right away, the mayo is cold enough for me. *Some prefer less mayo, so you can start with a tablespoon, then add a little at a time to the mixed Scallop Salad for desired creaminess. When Scallop Salad is cold enough it's time to toast the hot dog buns. Add pat of butter to skillet over medium heat. Melt butter and coat both sides of buns. They need a slight toasting for a couple of minutes on each side. 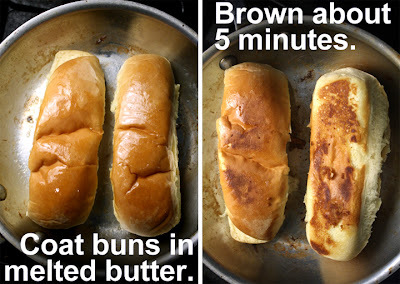 Done when lightly browned. 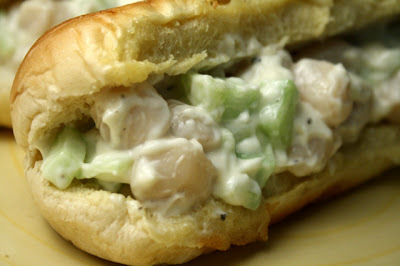 To serve, open the pre-split bun and scoop in the chilled Scallop Salad. *Another delicious spin is to use a small package of bay shrimp (which I often find for the same prices and locations), for a Shrimp Roll. 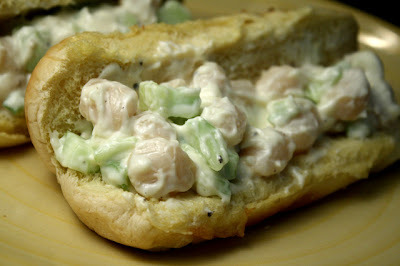 Since bay shrimp are usually cooked, just defrost, drain and add to mayo mixture. If they are raw then follow the sauteing directions from above. 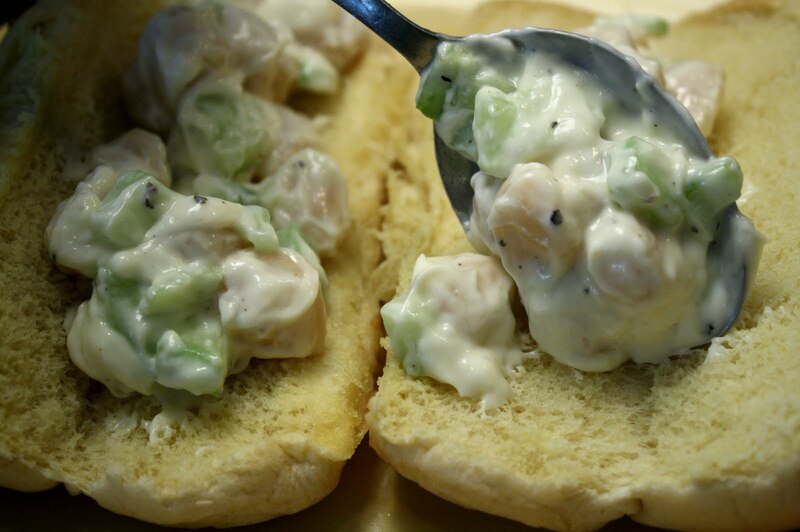 The 99 Cent Chef's Scallop Salad is a tasty high-class canape, too, just put a dollop on your favorite crackers or toast, and serve at your next party -- even your little finger waving high class guest will be impressed. Yum. I like. Shrimp or scallops--either sounds great. I agree about the mayo and butter. I may have used the last of these light products forever. My new philosophy is a little of the real thing or a lot of it once in awhile is the way to go. I've never had that lobster roll when in New England either...but if I get back there I will search it out. I think it was on the Rachael Ray $40 a Day show that I saw my first lobster roll. One of my favorite food memories is New England clam chowder and clam cakes, eaten late on a very cool fall evening when we were dog tired, in a run of the mill local place that looked like it had once been a fast food restaurant in Providence RI. Wow. Good food, good memory. Boy would I love to go back to NE in the fall. spantastic recipe. i'm going to try it this weekend. My grandmother use to make this thanks for the recipe.